I’m currently researching for a chapter in my thesis on Moltmann’s innovative trinitarian understanding of divine passibility (God, as Trinity, suffers). 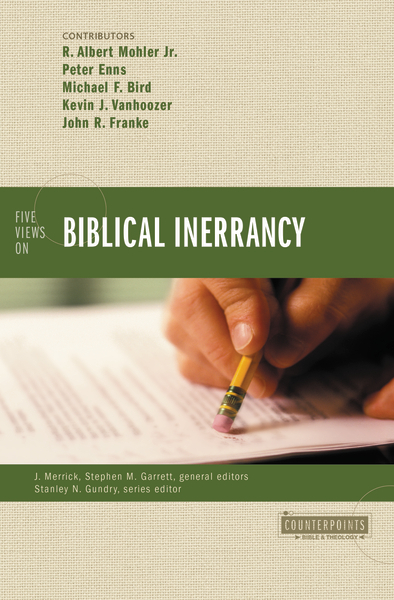 Kevin Vanhoozer is a contemporary impassibilist whose book Remythologizing Theology: Divine Action, Passion, and Authorship (2010) presents a meaty restatement of the classical theist (and, according to Vanhoozer, necessarily biblical) position on divine impassibility. One of the strengths of the book is Vanhoozer’s attention to words and definitions. He makes sure he defines his terms before using them (here, impassibility and emotion), which is too often left undone in other studies on the subject. “The physicalist view of emotions is not without significant problems, even apart from the issue of God’s corporeality [which camostar will not be addressing either]. First, such theories fail to acknowledge the importance of the influence of one’s beliefs on one’s emotions. It is not simply my seeing a snake that causes me to fear it but my belief that it is poisonous. Second, it is impossible to distinguish between emotions on the basis of physical sensations alone: fear, anger, and love alike may manifest the same physiological symptoms (i.e., rapid breathing). It follows that physical sensations are not themselves what we feel as emotions. Third, it is difficult to appeal to emotions as motives that explain a person’s behaviour if emotions are only bodily sensations. I do not shout at my neighbor because my heart is beating fast but because I am angry about what he did. Finally, while we regularly ascribe moral worth to certain emotions, it is difficult to hold persons praiseworthy or blameworthy for their sweaty armpits” (406-407). Why does Vanhoozer imply beliefs are non-physical? Obviously they arise in accordance with the environments that individuals develop within but this does not rule out the physicality of either those environments or the “cognitive” constructions that the individual develops. (By environment here neither do I make a distinction between nature and nurture. The environment is the individual and the individual is the environment. The distinction is nominal). Surely whatever beliefs are made up of that we identify as “cognitive,” for example memories, are a result of physical (at least if I’m reading this not as a Christian)* responses to the environment. Similarly, just because physical sensations are “smaller,” that is, occurring in the “mind” rather than the “body” like rapid breathing, the example Vanhoozer uses, they should not therefore be excluded from being physical sensations. Yes there is overlap between different emotions but to say that we can’t distinguish them physically is (a) to claim that the differences between them are unaccountable for physically, as if in the brain, too, the exact same thing is going on in both love and anger; and (b) comes close to the assumption that emotions are set categories anyway, whereas they developed pre/historically as organisms responded to their environments and, the same thing but accounted for in more recent terms, as human societies developed different socio-cultural contexts in which to be emotional. What if some emotions that used to be distinct are now “physiologically indistinguishable” and vice versa? Based on these first two objections to objections it should be clear now that shouting at a neighbour in anger can be accounted for in physicalist terms. It is a physical response as much as the heart beating is. Vanhoozer here shifts the argument. But just because we have socialised predispositions towards particular emotions, we cannot therefore make a theory of emotion conform to our ethics systems. It looks like I’ve come down rather hard on Vanhoozer. That’s why I’ve titled this post as a question. The objections I have raised seem patent to me but I feel like I’m missing something of the complexity of the argument because of my unfamiliarity with the literature. It has otherwise been a very illuminating read so far! *While not addressing questions of divine and human agency, my developing “Christian” understanding of physicalism accepts the classical theist “infinite qualitative distinction” (Kierkegaard) between God and the world. Through creation, God gives life to everyone and everything by the Holy Spirit, who in a very limited sense indwells them and guides them. In new creation, believers receive the Holy Spirit “properly,” in the same way Jesus received the Spirit, but for us as a deposit ahead of the resurrection. Included in Jesus’ divine sonship, we can live a life apart from the “physical,” though, in biblical terms, the world of sin and death, and instead live a life towards the new creation that God has brought in Jesus and will bring in Jesus. So my grades have been finalised which means I can put this online. For anyone interested it’s a postgraduate dissertation on Karl Barth’s Doctrine of the Trinity in CD I/1, §§8-12. The first part is just exposition of these sections and then there are three chapters interacting with secondary literature that look at the relationship between the immanent Trinity and the economic Trinity, divine personhood and modalist accusations made against Barth, and pneumatology. There’s no way I can even hope to cover at least some of these, though one might be possible. Nonetheless you might elect to indulge on my part! (They’re all theology related). 10. 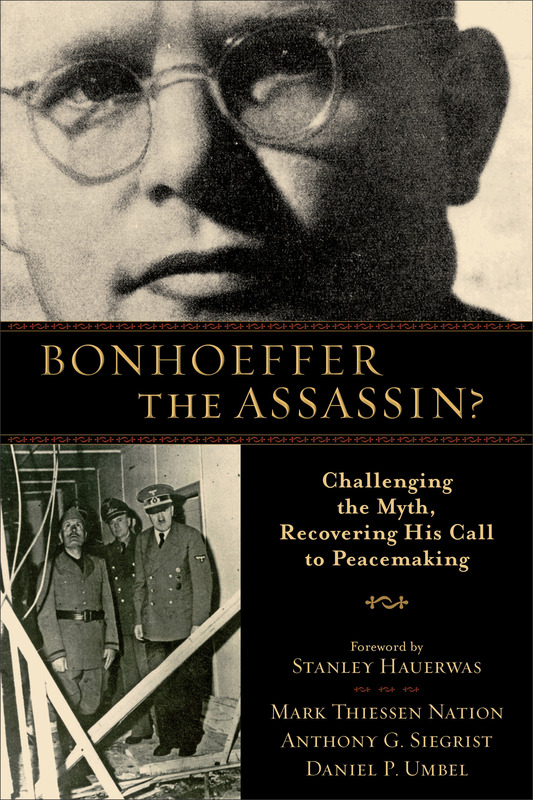 Bonhoeffer the Assassin? Challenging the Myth, Recovering His Call to Peacemaking by Mark Thiessen Nation, Anthony G. Siegrist, Daniel P. Umbel, with foreword by Stanley Hauerwas (Baker Academic: October 1, 2013). This book re-examines the popular thesis that Bonhoeffer attempted to assassinate Hitler, reviewing this in light of his writings, as well as exploring his ethics on pacifism. Check out the detailed and informed review from Roger Olson. Remember to read the comments section and this response to the review from one of the authors. 9. 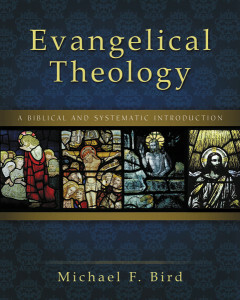 Evangelical Theology: A Biblical and Systematic Introduction by Michael Bird (Zondervan: October 30, 2013). Michael Bird is an Australian New Testament scholar who has spent his time among Baptists, Reformed, Presbyterians, and Anglicans: “I would describe myself as an ex-Baptist postPresbyterian Anglican.” Because he’s writing from Australia, he doesn’t need to be too careful about what he says either! 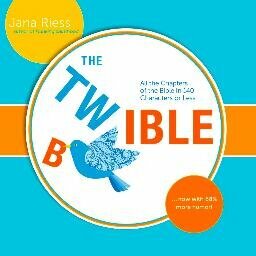 Some reviewers on Amazon are not too sure about his biblical studies background and think that more experience with systematic theology would do Bird well. I’m often of the opinion that more experience in biblical studies would do systematic theologians well! He’s also a bit hilarious. 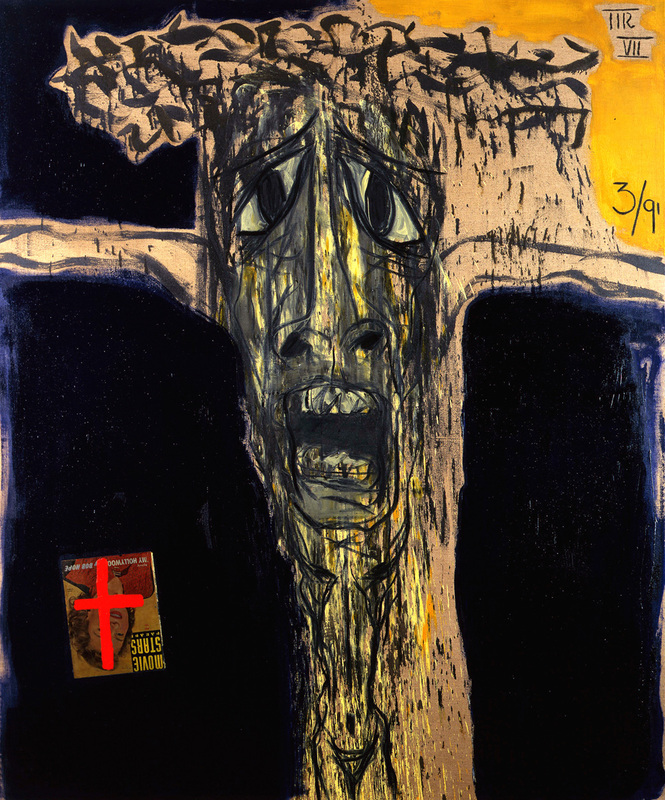 One reviewer cites his comments on penal substitution: “I do not wish to disparage Jesus’ death as an atoning, vicarious, substitutionary, and penal sacrifice for sin. May I be anathematized — or even worse, may I be tied to a chair, have my eyelids taped open, and be forced to watch Rob Bell Nooma clips — should I ever downplay the cruciality of Jesus’ sacrifice for sinners” (he goes on to qualify this; it’s just too long to include). Laidlaw, the Bible College I went to this year, is probably going to be adopting this 912 page introduction as the textbook for all theology courses from now on. It would be handy to have around as a reference! 8. 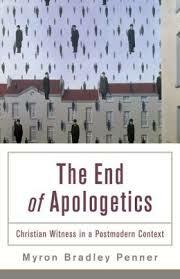 The End of Apologetics: Christian Witness in a Postmodern Context by Myron Penner (Baker Academic: June 15, 2013). Not that I’ve looked into the basis for apologetics, but taking a leaf out of Kierkegaard’s book I suppose I’ve been quite ambivalent to it. It would be interesting to see how Penner attempts to reappropriate this sometimes controversial Christian inheritance. 7. 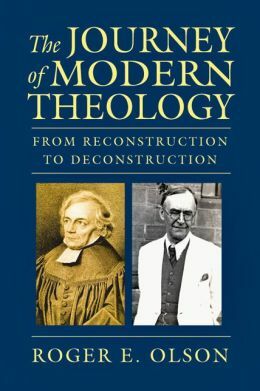 The Journey of Modern Theology: From Reconstruction to Deconstruction by Roger Olson (IVP Academic: October 31, 2013). Olson, an establised and learned teacher of modern theology, traces the major developments over the last 300 (?) years, looking at the epistemological soup from which it emerged, Scleiermacher and liberalism, American evangelicalism, all those amazing 20th century Germans, and postmodern and postliberal theologies, plus more. At 720 pages, this probably more for reference than light reading, though the latter will most probably do you a lot of good! 5. 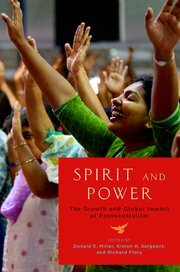 Spirit and Power: The Growth and Global Impact of Pentecostalism edited by Donald E. Miller, Kimon H. Sargeant, and Richard Flory (Oxford University Press: July 24, 2013). A collection of essays on global pentecostalism, including why it’s growing, pentecostalism and politics, gender, and an appendix with figures. How can you not be excited!? I’m not 100% but pretty sure it’s not the Blue Like Jazz guy. 3. 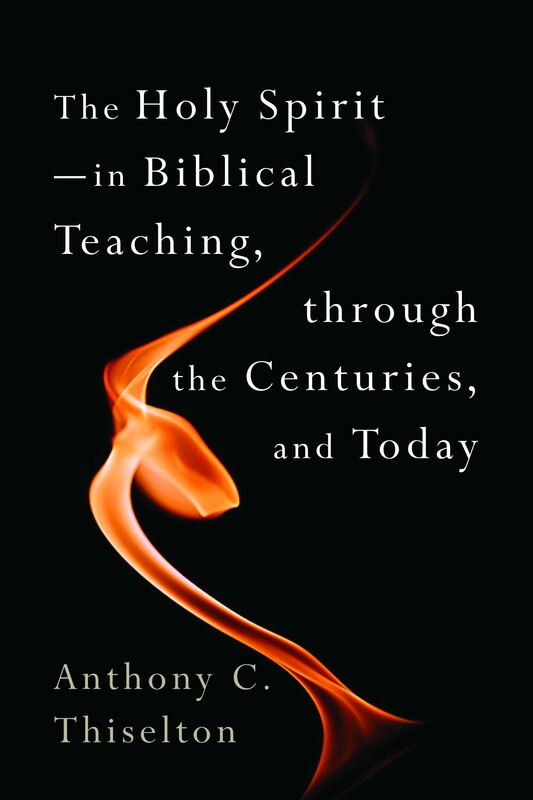 The Holy Spirit: In Biblical Teaching, through the Centuries, and Today by Anthony Thiselton (Eerdmans: June 1, 2013). Thiselton has written extensively on hermeneutics, as well as penning a large and impressive Greek commentary on 1 Corinthians. He is in (mostly suspicious) dialogue with postmodernism and explores Christian responses to this. He’s in his seventies and still going strong! Again, this is another sort of reference book (579 pages), briefly laying out biblical understandings of the Holy Spirit and then tracing these through history to contemporary approaches in theology. 2. 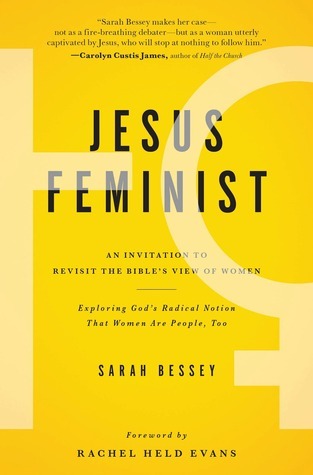 Jesus Feminist by Sarah Bessey, with foreword from Rachel Held Evans (Howard Books: November 5, 2013). Gender is one of the most important issues that evangelicalism needs to grapple with at the moment! Jesus and Paul, among other voices in the Bible, have been variously praised and criticised/critiqued for their approaches to gender. Sarah Bessey sees that there is at least some positive potential there. It will be interesting to see where she takes it! 1. 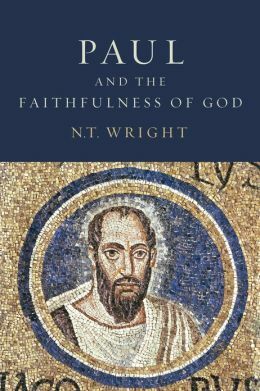 Paul and the Faithfulness of God by N. T. Wright (Fortress: October 17, 2013). What else did you expect? N. T. Wright is possibly the most prolific contemporary Pauline scholar. At 1700 pages (1519 of reading material), this is a force to be reckoned with. Love him or dislike him, this is required reading for anyone who wants to seriously engage with the New Testament. 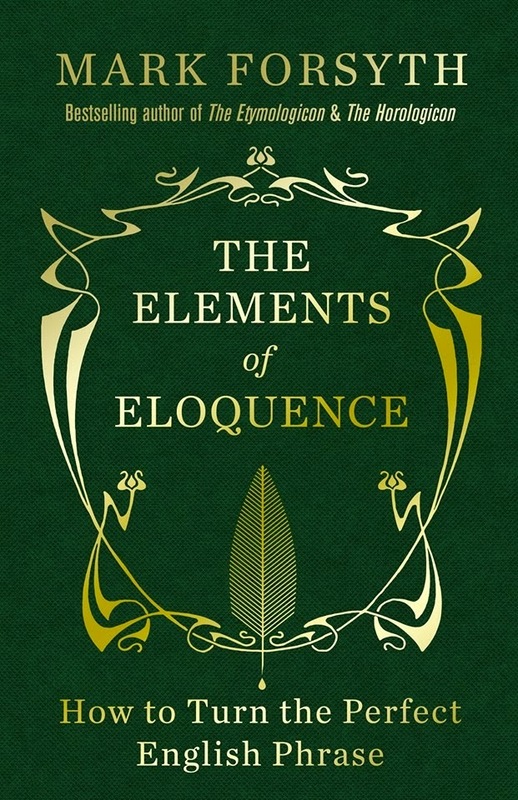 Bonus: The Elements of Eloquence: How to Turn the Perfect English Phrase by Mark Forsyth (Icon Books: No date… but quite recent!). I’m not all theology nerd! Forsyth is an etymologist, that is someone who looks at how words came about. In his new book he introduces his readers to the ancient discipline of rhetoric, that is, how to speak well. But even if we or an angel from heaven should proclaim to you a gospel contrary to what we proclaimed to you, let that one be accursed! […] Am I now seeking human approval, or God’s approval? Or am I trying to please people? If I were still pleasing people, I would not be a servant of Christ. A running theme throughout Galatians is God’s plan and initiative above human tradition. Thus Paul can say right from the get-go in verse one that he is “sent neither by human commission nor from human authorities, but through Jesus Christ and God the Father”. He can say later that in light of his divine call the leaders in Jerusalem “contributed nothing to [him]” (2:6). 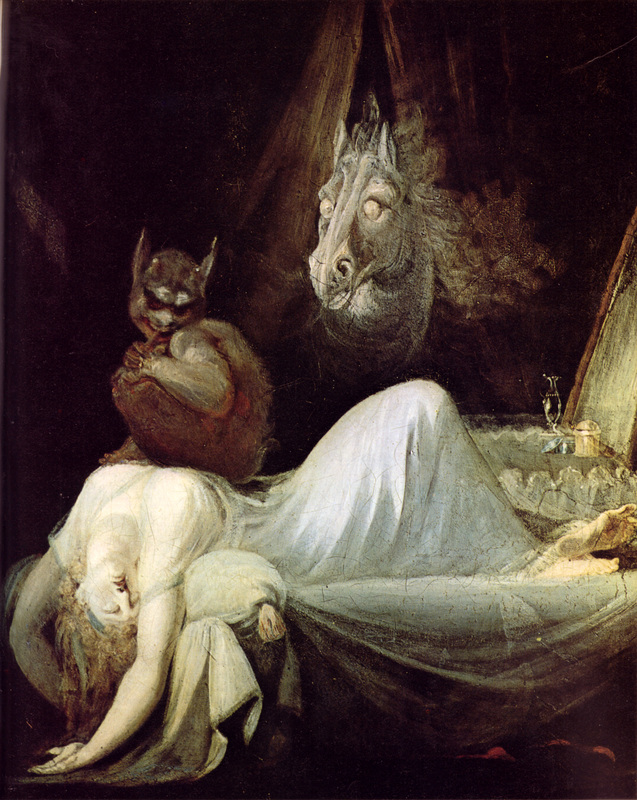 And this also gives meaning to the later distinction between Spirit and flesh (eg. 3:3, 4:23, 5:16…). 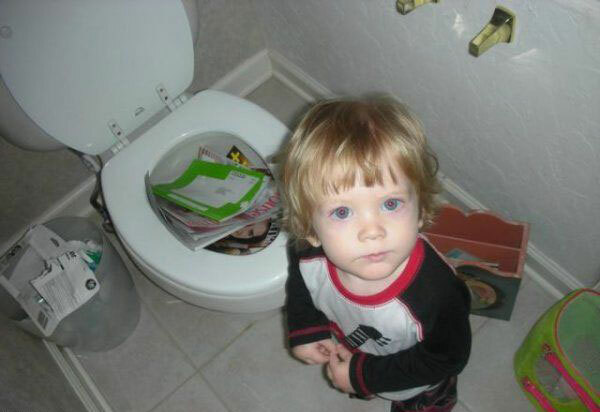 You’ll understand when you’re older, mum. Paul’s statement on who he’s trying to please needs to be held up to closer scrutiny. How can he make his essentially unintelligible call intelligible to others? Or why is his call unintelligible in the first place? This is Kierkegaard’s existential insight in Fear and Trembling: Abraham is called by the Lord to sacrifice his son, Isaac. In his very old age his wife, Sarah, (who, too, is a fossil) manages to bear a son, no doubt a blessing from God. How can Abraham make it intelligible to others that the Lord is asking him to give up his only descendent² and forfeit his name? Mary is visited by an angel and told she will bear the Messiah. “Hey guys, I’m pregnant, but don’t worry I haven’t been sleeping around, it’s just that God in human form is in my womb”³. Kierkegaard says of Mary that the “one whom God blesses he curses in the same breath”. 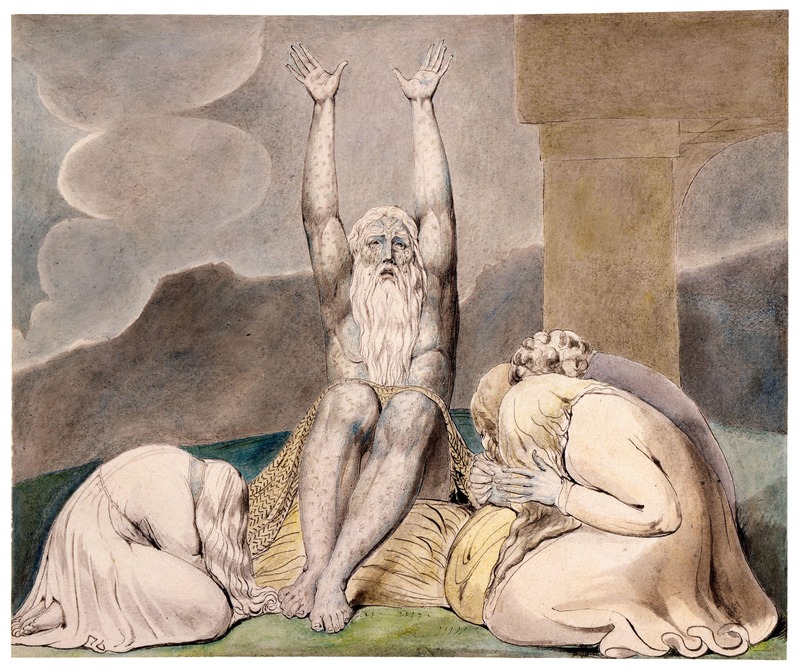 I came across another example in church last Sunday when the speaker spoke of Joseph’s story in Genesis: Joseph was shown in a dream that he would rule over his brothers, so he thought it would be a good idea to tell them, partly contributing to his almost being killed and sent into slavery by them (Genesis 37). Calling, whether or not it can be made intelligible to the called, is immediately unintelligible to those around him or her. Paul’s call is after his conversion, in Kierkegaardian terms, no longer a duty to God through the universal, which would entail all the practices he was obligated to under Judaism, but a duty to God through the particular, that which God calls the individual to. As soon as Paul attempts to justify his call to other people, it loses its particularity between God and himself and enters the universal. No doubt Paul does attempt to justify something to his readers, because he is involved in matters that concern a whole lot more people than merely God and himself. Paul needs to justify to the Galatians that they need not be concerned with circumcision and abiding by the law. Yet Paul also attempts to justify his calling, but on what terms? He must make his appeal through the universal not to the particular, because that exists only in itself, between God and Paul. Any attempt to even describe it undermines it by electing a universal criteria with which to describe it, like language, or by saying there is some commonality between God’s call to Paul and God’s call to another (though that we can even say there is particularity shows that there is a universality to particularity). Paul must then make his appeal through the universality of language to, in this case, the universality of divine retribution4. He can therefore bind himself to an oath (1:8) and speak not just before his human audience, but before God (1:20) to assert his honesty regarding his call. Other than the possibility that Paul is speaking truthfully on pain of damnation, three other possibilities arrive. (a) Paul is blissfully deceived; (b) he is speaking deceitfully before both man and God; or (c) he is appealing not to a commonality that he shares with his readers but to one only they share among themselves, in the same way that someone can walk under a ladder or open an umbrella inside as an act of self-sacrifice for their unwilling, superstitious friends. This is a witch. If I’m lying then the witch is going to kill me in my sleep. 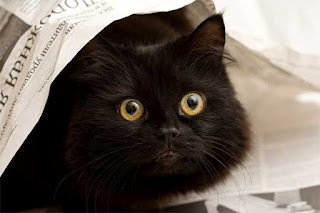 You’ll just have to take my word and the cat’s face for it. These possibilities show the ultimately inaccessible particularity of Paul’s call to the Gospel. On one level it is universal and can be made known to other people, but on another level, that of the possibilities above, Paul cannot make himself intelligible to his audience when speaking of matters between himself and God, namely that he is telling the truth. Why then is the Epistle to the Galatians still available to use today? Why didn’t it get burnt by Gentiles zealous for the law? How is it possible that Paul is seen as speaking truth albeit being ultimately impenetrable? It is not only that Paul takes his theology from scripture, appealing to the universal throughout the letter, but that the early church depended on the universality of particularity: The Holy Spirit. This is an absurdity not just of Christianity, not just of religion, but of all belief systems: Everything rational is ultimately taken in faith. All objectivity is subjectivity in disguise. All truth is untruth. Christianity takes as its chosen untruth, the Holy Spirit. This is the absurdity of Paul’s call: “The gospel that was proclaimed by me is not of human origin; for I did not receive it from a human source, nor was I taught it, but I received it through a revelation of Jesus Christ” (1:11-12). The writer of Acts renders Paul’s conversion experience in a certain way (Acts 9), but, as a rule, primary literature should first be taken into consideration. Paul claims that he has seen Jesus and later compares this to other post-resurrection appearances of Jesus (1Corinthians 9:1, 15:3-8), and his description of being caught up into Paradise possibly adds to this account (2Corinthians 12:1-4). What is absurd about Paul’s experience on which he bases his life purposes? What is absurd is that he privileges a particular finite means for access to the call of God. Some people may continually read the collected wisdom of thinkers ancient and modern to ascertain the meaning of life, some may view life as statistics and numbers and embrace the idiosyncratic nooks and crannies of nihilism, another may find their complete meaning in being in the presence of certain person. For Paul it is the experience of revelation which sits at the base of his call5. It’s interesting to note that Paul’s call compels him to three years serving the Lord in Arabia, Damascus, and possibly other unmentioned places, before spending some time with Peter in Jerusalem and after another eleven or fourteen years on the mission field (the text is unclear) Paul returns to Jerusalem, surprise surprise, in response to another revelation (Galatians 1:15-2:2). Paul leaves it this long after his conversion to consult the leadership in Jerusalem, “in order to make sure that I was not running, or had not run, in vain” (v.2). There’s a little bit of classic irony there, and I wonder if Paul himself saw the humour in his actions. Yet that Paul did this in response to a revelation will not be easily dismissed: revelation was still primary, though now it required supplement to be fully justified. His approval from leaders in Jerusalem was not something that revelation could be swayed by; his approval was commissioned through revelation. Notably, the individual nature of Paul’s call has not changed. What is the outcome of Paul’s Christian individualism? It is responded to and approved (2:7-9) by those who also, to some extent, work in the same medium of call as Paul does, and then supplemented by an appeal to a universal ethic, remembering the poor (v.10). This is the universality of particularity. When both parties are responding to the call of the Holy Spirit then this call is common to both parties; it is universal. Thus Paul can say of those in Jerusalem “they saw that I had been entrusted with the gospel for the uncircumcised” (2:7) because the leaders recognised that where God had been at work in their own lives and the lives of those around them, he had also been at work in the hearts of those who formerly actively opposed the Gospel (1:23-24). The only way that the conversion of their enemy was intelligible to them was through the work of God in their own lives. And this is the subjectivity, whether it be revelation in whichever of its infinite forms, which ensures Galatians in our modern biblical canon: The Holy Spirit was not just at work in Paul but in the hearts of his readers. ²Ishmael, born to Hagar, Sarah’s handmaid, realistically doesn’t hold as much value in this position, considering ancient Near East perceptions of family, etc. ³Noting, however, that an angel appears to Joseph to clear things up (Matthew 1:20) and John the Baptist’s mother was aware of it according to Luke too (1:43). In light of the other examples, allow a little room for Mary’s story to be read as Kierkegaard reads it, for the sake of the argument. Even so, he may have understood Mary’s original call to bear the Messiah, before elucidation to others, as strictly between her and God, and this is what he is focussing on in the example. 4 I use universality quite loosely here to refer to any commonality among a group of individuals, and I realise that this is the proper use, as true Kantian/Hegelian (?) universality which Kierkegaard uses as a reference point is undermined by Kierkegaard himself and Nietzsche onwards: There is no universal morality, code, ethics, etc. This universality that people refer to is a fantasy and only exists to some extent (though in absolute terms to none at all) within different groups of people. Thus language expresses the universal as much as ideas are universally accessible through it, but it is an approximation of the universal as much as the individual’s subjective perceptions of language allow for infinite nuances in interpretation. 5 The other sources of call given may disregard revelation by, for example, openly rebelling against God in light of the revelation, attempting to the revelation, dismissing revelation as human fantasy, etc.